I've been a very lucky girl today and was allowed a sneak preview of Beatsworkin's pop up yard sale! and oh my dayz is there some bargain's to be had. For those of you that don't know Beatsworkin in Barnstaple is having a refit over the next two weeks and therefore will be closed, but never fear there online shop is still available and for those that live a little closer, owner Glenn has rented a VERY small shop ( not a yard ) opposite from Beatsworkin on Queen st for the duration. Now with the new refit comes new stock ! So in order to make room for all the new goodies Beatsworkin are having a sale in the pop up shop with up to 70% off some items yes 70% !!!! and at least 50% off the rest, get yaself down there for some Element, New era, Carhartt and more bargains, you would be a fool not to pop along ! 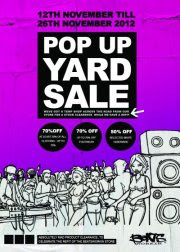 The yard sale starts Monday 12th Nov at 10 am ( expect queues down Queen st ! ) and finishes 26th Nov.